« Jared’s 2012 Holiday Tech Gift Guide! Visual Acuity, DPI, and Resolution – Revisited! So a couple of months ago I wrote an article called Visual Acuity, DPI, and Resolution about ideal viewing distances and TV sizes. Yesterday I went to teach in a new classroom and realized that the students were having problems viewing the display and I figured it was time to revisit the conversation with a case study. The classroom has the InFocus MondoPad – which is a touch screen interactive computer – really designed for white boarding and teleconferencing. While I haven’t been a big fan – I was keeping an open mind. During my first class experience I discovered that – for intensive training – I needed a keyboard and a mouse (and a display) in front of me – that using the MondoPad as a standalone could be useful but really I needed it to be a larger display – so I hooked up a laptop. When plugged into a laptop it is basically a large 55″ LCD display of 1280×720 (I wasn’t able to get the setup to produce 1080p). 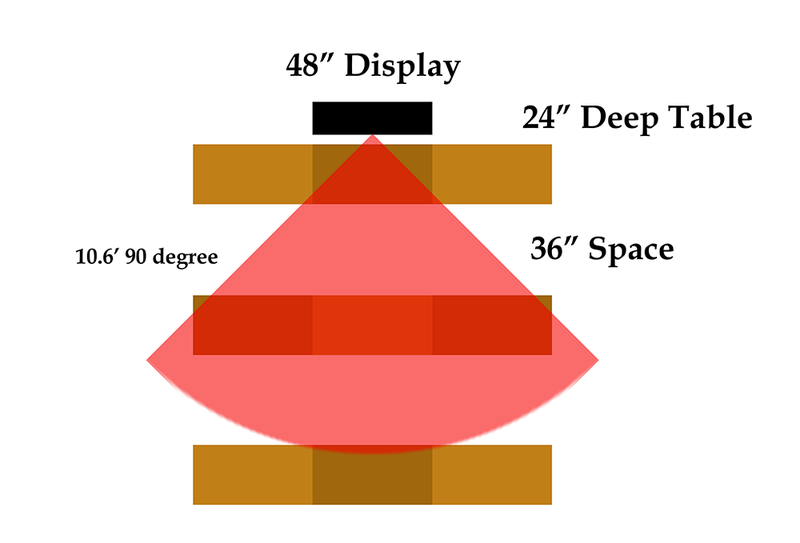 A 55″ television (which is measured diagonally thanks to Madman Muntz) is really 48″x27″. At 720p (1280×720) – this gives us a DPI of 27. At 1080p (1920×1080) – it would give us a DPI of 40. Unlike TV viewing where you want to sit back enough for the pixels to blend together – just past the range of visual acuity – with a monitor – you NEED to see the pixels (so you don’t lose any information). So being able to resolve each pixel is critical. So the question is – how close does someone with 20/20 vision need to be to resolve 27 or 40 DPI. So that sounds pretty good right 10.6 feet? Well now it gets tricky with the average table 2 feet deep – and the ADA requirements of 3 feet between tables – you hit 10 feet by the end of the second row (and that is assuming that the monitor is right in front of the first row). This of course assumes straight on viewing! Since we need multiple people sitting together it spreads out the distances and the angles. The viewing angle of the MondoPad is 89 degrees (we can call it 90). Remember this isn’t a family in a living room cosy on a couch but people spaced out at tables or desks – attempting to be able to resolve all the material. Also this is at 720p which is a hard resolution teach teach most software at to begin with – at 1080p the distances become even smaller. Assuming 24″ of space (width per person) our above diagram pretty much says 8 people can see the screen – 2 in first tow, 6 in second row and that’s it.